The strawberries are here! The strawberries are here! (Apologies to Steve Martin.) Yes, the strawberries are here, but they won’t last forever. The season is already half over, according to Kathy Bures of Bures Berry Patch, where you can pick your own or place an order to be picked for you. Strawberry lovers are out in force, especially after the poor berry season last year. 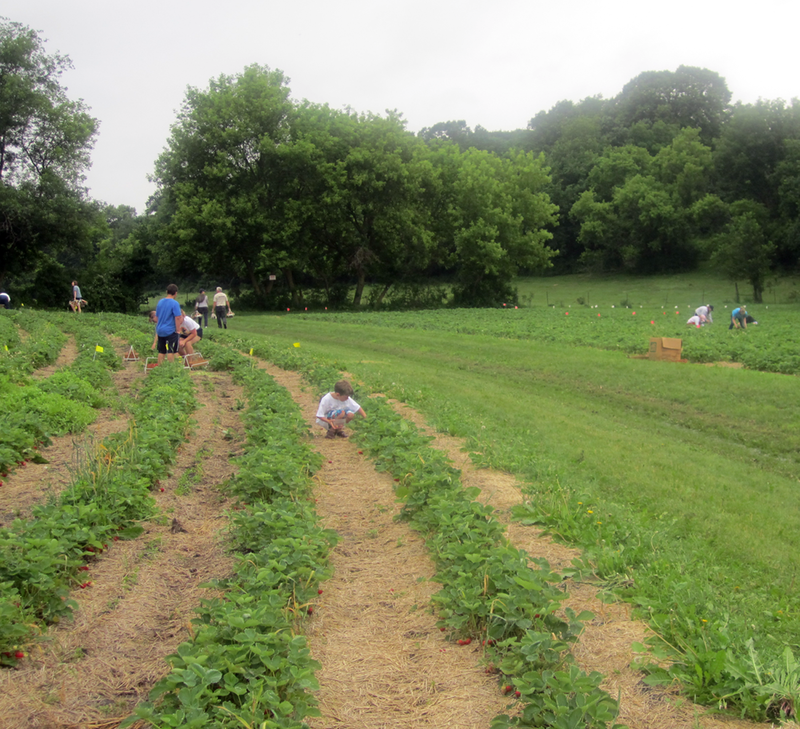 Even after Friday night’s deluge – the patch got about 7 inches – pickers were ready to go Saturday at 8 a.m.
We made the trip out yesterday and were rewarded with two overflowing boxes of berries in about an hour. That also included time for jumping in puddles, petting Otis the dog and visiting the chickens. Ed and Kathy Bures have been growing strawberries for over 10 years. In addition to the juicy berries, they also have asparagus, peas, rhubarb, potatoes, raspberries, sweet corn, squash, pumpkins and eggs. Every Saturday in the summer they bring their goods to the Mineral Point Farmers Market, which Kathy co-manages. 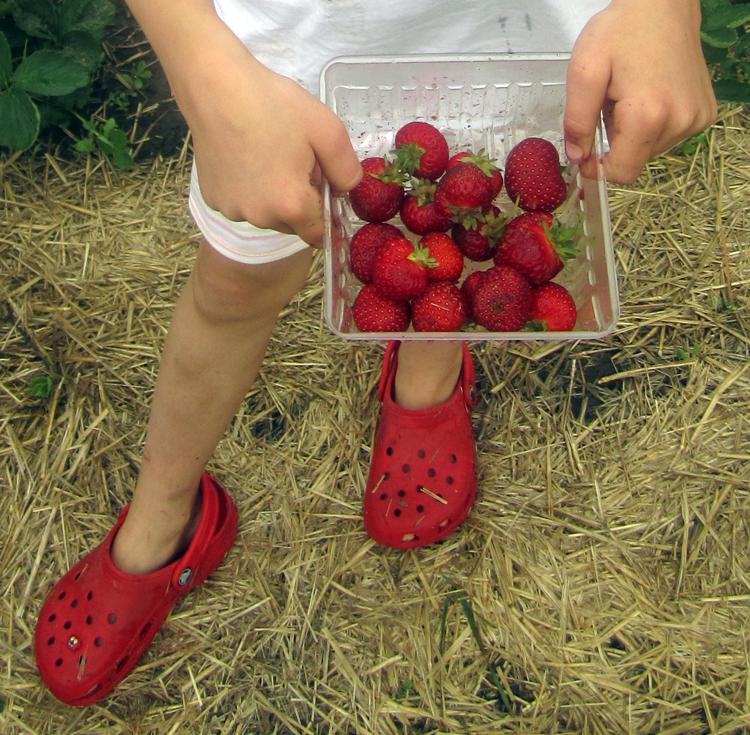 You can call ahead and place an order for pre-picked strawberries or pick your own. Check their website or call the berry hotline – 608-924-1404 – for hours and details. If you are going to pick your own be sure to call first, as weather and availability may close the patch. To get to there from Mineral Point, head north on 151 for 15 miles, turn right onto Brigham Road, and after a minute or two you are there. If we don’t make it back this week for more strawberries, we will definitely return in the fall to search for the perfect pumpkin. This entry was posted in Family, Food, Outdoors and tagged Bures Berry Patch, Ed Bures, Kathy Bures, Mineral Point, Mineral Point Farmers Market, Steve Martin, strawberries, Wisconsin. Bookmark the permalink.